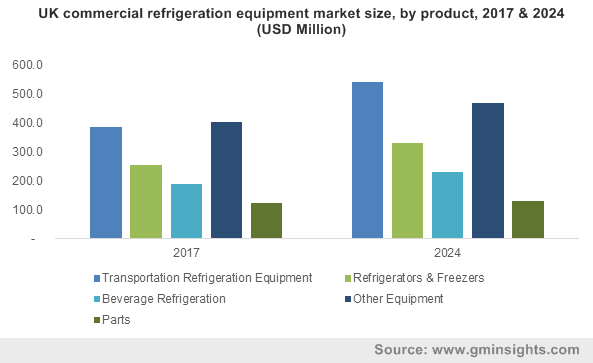 Commercial Refrigeration Equipment Market size was over USD 30 billion in 2017 with over 3.5% CAGR estimation between 2018 and 2024. The global shipments are expected to surpass 18 million units by 2024. Increasing demand for packaged food and beverages coupled with growing hospitality sector is expected to drive the commercial refrigeration equipment market growth over the next six years. The food consumption preferences are increasingly shifting toward healthy diets, increasing the demand for frozen foods. According to the Academy of Nutrition & Dietetics, frozen fruits and vegetables lock up more nutrients than the fresh ones that are consumed after a few hours of picking. This trend has resulted in the accelerated growth of commercial refrigeration equipment market growth. The growth of the food retail sector across the globe is aiding the commercial refrigeration equipment market growth. Growing demand for all-natural and organic products has propelled the demand for premium goods from grocers. Consumers are eating healthy foods and are willing to pay extra for high-quality products and the suppliers are increasingly investing in fulfilling consumer demand, propelling the industry growth. Growing stringency of regulations and rising concerns regarding the use of harmful refrigerants that result in global warming are providing viable growth opportunities to the commercial refrigeration equipment market. For instance, magnetic systems use green technology that has high energy efficiency and requires low maintenance. According to the U.S. Department of Energy, these systems provide about 30% energy savings. Furthermore, reduced emission of hazardous gases and reduction in operational costs will propel the use of the technology over the forecast timespan. Transport refrigeration systems accounted for over 25% of the global shipments in 2017, and are expected to constitute majority share of the commercial refrigeration equipment market. Growing international food trade and growing transport of perishable products across borders are increasing the demand for these systems. Vegetables and fruits are being increasingly transported through roadways, propelling the demand for this equipment. Fruits and vegetables, such as lettuce peas and sweet corn, that have very high respiration rates require colder refrigerators to maintain the freshness and increase their shelf-life. Refrigerator & freezers are expected to gain a considerable share in the commercial refrigeration equipment market, with an estimated 4% CAGR over the forecast timespan. These products include reach-in, walk-in, and chest type refrigerators. Increasing number of restaurants and growing demand for frozen foods in supermarkets is propelling the commercial refrigeration equipment market growth. The introduction of advanced products, such as open front cases and multi-deck display cabinets, that incorporate LEDs and proximity sensors is expected to provide high growth prospects over the forecast period. The food service application sector will dominate the commercial refrigeration equipment market, with shipments forecast to exceed 4.5 million units by 2024. Growing number of food chains and increasing consumption of fast food will propel the demand for this equipment in the foodservice industry. According to the Center of Diet and Activity Research (CEDAR) of the University of Cambridge, the total number of fast food outlets in England has increased by 4000 since 2014. 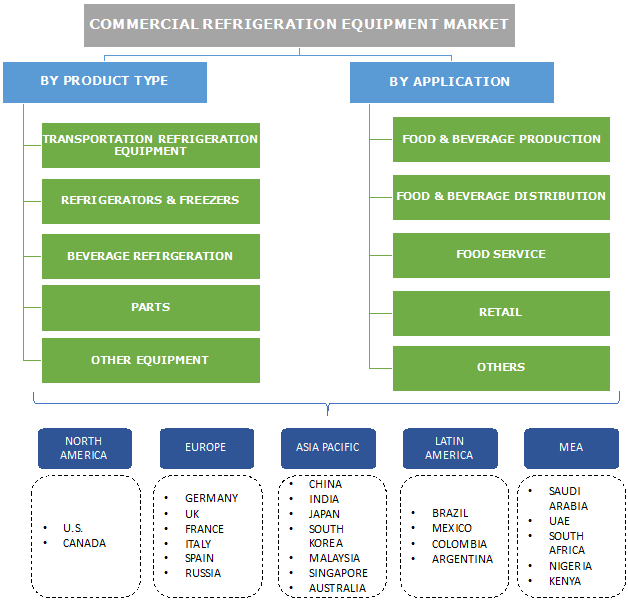 Commercial refrigeration equipment market Food and beverage production applications are forecast to grow at 2.5% CAGR, particularly due to the production of milk & dairy products. Reducing prices of these products and increased consumption have resulted in an increased production of milk and dairy products such as cheese & butter. According to Eurostat, in 2016, approximately 96% of milk produced in Europe was utilized to produce products such as cream, butter, cheese, and powder products. The India commercial refrigeration equipment market is expected to grow at over 5% CAGR in terms of revenue over the forecast timespan due to the growing demand for frozen food in the country. The demand for healthy and less time-consuming foods is increasing rapidly in the country owing to the increasing number of working women. Growing middle-class population with increasing disposable income and increasing number of working population in the country will propel the commercial refrigeration equipment market growth. The retailers and suppliers are increasingly focusing on equipping the stores with technologically-advanced cooling equipment. The U.S. commercial refrigeration equipment market, which approached USD 10 billion in revenue in 2017, is expected to witness growth due to growing food-service sector in the country. Customers continuously spend increasing sums on food outside homes. Growing trade in beverages and food, in the light of increased food production, will accelerate the industry growth over the forecast timespan. Some of the key vendors in the commercial refrigeration equipment market are Emerson Electric, Johnson Controls, Parker Hannifin Corp., Ingersoll-Rand, Plc., Danfoss A/S, Hussman Corporation, Lennox International, GEA Group AG,0020AB Electrolux, and Daikin Industries Ltd. The companies are undertaking strategies such as mergers & acquisitions and new product development to gain a competitive advantage. For instance, in 2015, Daikin acquired the refrigeration business of Solvay business to establish the presence in Europe and expand its product portfolio. In the same year, Carrier launched a monitoring system that enables maintenance departments, building owners, and other users to remotely monitor and track their HVAC systems. The traditional nature of the industry and overwhelming competition among the commercial refrigeration equipment market participants have compelled the players to establish a brand value for sustaining and advancing in the industry. The barriers to entry in the industry are high due to significant R&D expenditure, large capital investment required, and growing stringency of regulations set by the governing bodies. Food consumption patterns have evolved over the past few years, primarily due to the overall economic development, decreasing prevalence of dietary deficiencies, and technological developments in the food industry supply chain. Growing industrialization and commercialization, coupled with growing disposable income are driving the commercial refrigeration equipment market. The changing demographic trends, such as technological advancements and growing urbanization, are stimulating the commercial refrigeration equipment market growth.